Sculpture finds itself caught in a web here, since its ‘history’ is so radically different to that of painting. It does not contain the continuum of the post-Renaissance achievements found in painting. 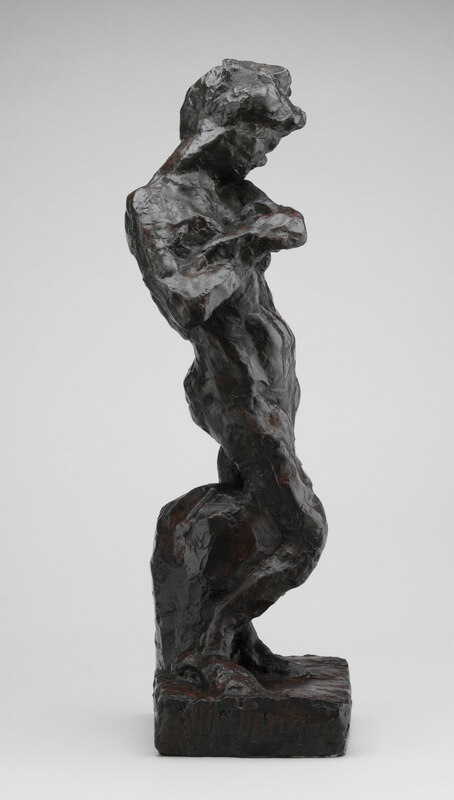 Only in the work of Rodin can one truly say that a new vision of the perception of sculptural form, equivalent to the radical contemporary moves in painting, exists, to which the words ‘path to abstraction’ could be applied. It remained for the post-Rodin sculptors to attempt a move on from his work; not the Bourdelle and Camille Claudel followers, but those with the insight to see that it was Rodin’s perception that form could be radically reinvented (from nature) and reassembled, that was innovatory and inspiring for a new sculpture. Rodin himself considered his work a ‘revival’ of old lost values, and would not, I think, have understood the word ‘abstract’. His astonishing ability to manipulate his material through the stretching and shrinking of proportions; his distortion of ‘correct’ anatomical parts; his perception of and insistence on the liveness of ‘movement’ as a sculptural force, would subsequently lead to his being perceived as part of the modern canon. 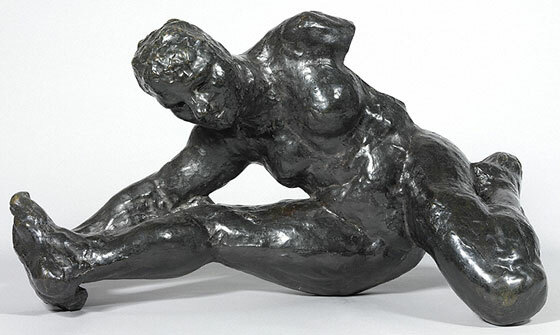 Chief amongst the younger sculptors who did have insights into Rodin’s work which enabled them to make radical sculptural moves in their own right, were Matisse and Brancusi who reacted in totally different ways. From Brancusi’s “flowers do not grow beneath great trees”, he developed an austere carved primitivism; to subsequently turn to African art for inspiration which, it had been realized contained, inherently, a previously unknown ‘abstract’ vision of form. Matisse, whose work as a painter was as much responsible as Picasso and Braque for a new art, though not a ‘sculptor,’ consistently made innovative pieces which actually outdid the sculptors in the radical rephrasing of figurative form. 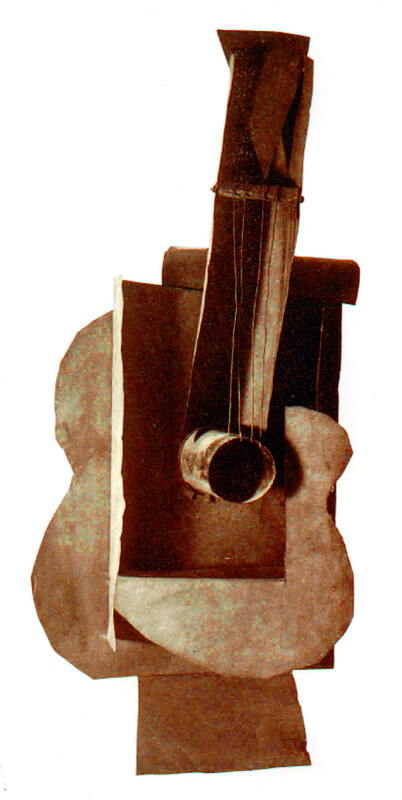 The impact of Picasso’s collage and the constructions developed from it was profound: Laurens, Lipchitz, Archipenko, Boccioni, the Russian Constructivists; all attempted to develop new forms of sculpture-making from its example , but the model of an abstract sculpture had not yet, then, fully arrived. It was to be Picasso again who unwittingly, (i.e. unintentionally), laid the groundwork for a fully developed abstract sculpture to be, through the wildness of spirit in his ‘constructions’ and in his collaboration with Gonzalez, who subsequently developed his own forged and welded metal sculpture. A word must also be said of the impact of Surrealism which, in the twenties and thirties gave to sculpture a vocabulary of form-making which was ‘organic’ but not directly imitative of the human figure and ‘abstract’ in that sense. By mid-century, sculptors such as Chillida, David Smith and Jacobsen, had all ploughed a path for what was by then established as abstract sculpture. The constructivist movement and indirectly its influence on the early work of Moore and Hepworth had added to the perception of the term’s meaning. This’ abstraction’ it must be said, competed with many other styles across a time frame of fifty years or so, and abstract sculpture was by no means seen as the dominant or only form of ‘progressive’ sculpture. Abstraction in sculpture in the first half of the 20th century is, then, a rather contentious label which could be more accurately described as being a vision of the world seen in hybrid plastic terms. This paraphrase of history leads me inexorably to the work of Anthony Caro. 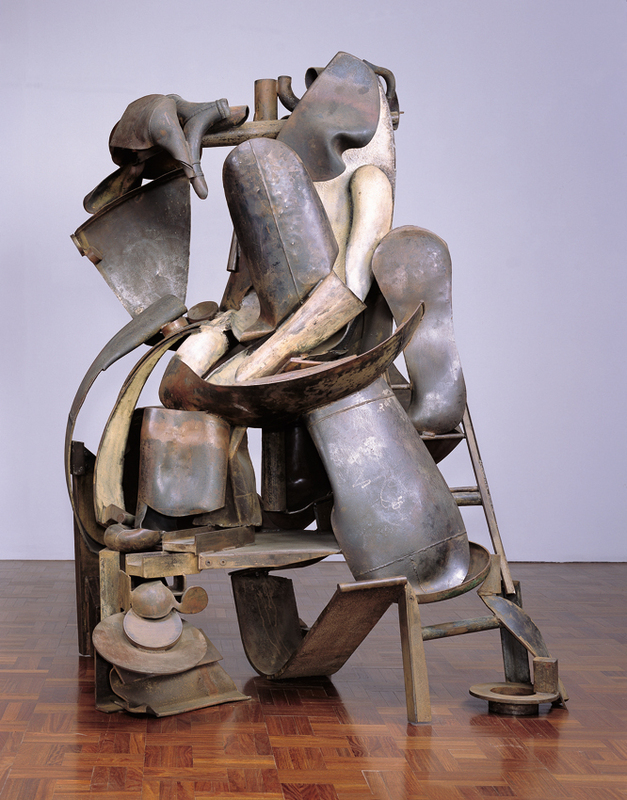 Much commentary in abstractcritical/Abcrit centers on the early steel work of Caro as being central to the development of an ‘abstract sculpture’ that would stand on the same principles as had been advanced for painting. This vision of its role was accompanied, at the time, with the Greenberg/Fried view of its content being ‘optical’ rather than ‘physical’ or three dimensional. This was a new form of sculpture which departed extensively from the massing of volumes and their physical, tactile relationships of old. Sculpture could now operate freely in space without consideration of connections or gravitational limitations. It was truly ‘abstract’. Earlier 20th C. abstract sculpture was therefore considered less radical than the new moves made by Caro from 1960 onwards. Abcrit commentators seem to be, on the whole, at one in the view that this period of Caro’s oeuvre is the summit of his achievement, and that subsequent work, roughly from the mid seventies onward, rarely matched it. I do not so much want to examine the truth or otherwise of this opinion, as to unravel some of the underlying factors which have given rise to it. Caro’s work, as a comparatively young man, was part of an ‘avant-garde’ of British sculpture, succeeding the Butler, Chadwick, Armitage group, consisting in particular of similar-aged colleagues Paolozzi and Turnbull. If at all, Caro’s influence during this period was less directly from his work than from the panache with which he promoted ‘being a sculptor’, its ambitions and possibilities, particularly with his students. His classes were conducted as if they were in a studio. Caro was a generous, energetic and outgoing personality and he projected this onto all who came into contact with him. Any younger sculptor who was embarking on his/her career at that time, and subsequently, could not remain untouched by his example, usually stylistically, but at the very least in ambition and dedication. 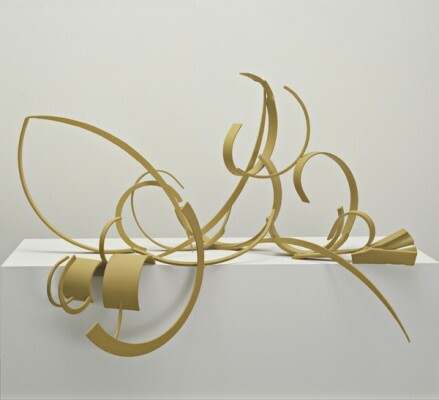 Caro’s sixties ‘breakthrough’ into abstraction, and the seminal Whitechapel show of 1963, have been amply covered by Abcrit commentators, notably by Alan Gouk. Any sculptor who saw this show would have been struck by the pure visual poetry it contained; it is hard now to recreate in one’s mind, conditioned by endless reproduction, the impact of the sheer originality it conveyed. Turning to Caro’s post sixties changes of style and development of his range, we are faced with an enormous time span of forty plus years of constant experiment to find new directions, resulting in hundreds of sculptures. Doubtless, as many have assumed and written, this is in itself an admirable course of action, leading, as it inevitably did, to a huge variety in his work. In order to make any sort of qualitative assessment of so many in such a pot pourri of eclectic styles, one is faced with a sort of mental atrophy. Caro, from the outset, acquired a ‘Picassoid’ mantle, which matched his temperament, and which provided him with the career challenge that made his name. Obviously, there are moments of individual pieces, or even groups of pieces, being stunningly effective, at the very least as ideas. No output of sculpture in the 20th C. has remotely matched his; and his projection of a ‘titan’ image of creative energy was of supreme importance to his view of himself as a sculptor, and is unlikely to be matched. The ‘mini’ period of post sixties steel sculptures, lasting roughly until the mid to late seventies, became the model for dozens of younger sculptors to build a foundation for their own work. Indeed , a ‘school of Caro’ became either a label of ‘club membership’, or alternatively, abuse; or something to escape from; only thereby adding to the power of his example. This example undoubtedly spread the acceptance of abstract sculpture across a far wider audience -whose tastes had been arrested at the example of Moore -than ever before, and likewise helped to make it part of our visual culture, a tremendous achievement for one artist. Given the huge range of Caro’s work following this steel period, and given the fact that it would seem to be abstract artists, rather than commentators or critics, in particular, who perceive an aesthetic ‘break’ in his output between the sixties/early seventies work and the rest of his oeuvre, I think it would be of interest to attempt some sort of examination of the evidence as to whether or not this is so. Firstly Caro’s ‘methods; of how he set about making sculpture, initially and subsequently. I have said, a long time ago, in a review of a coffee table book of Caro’s sculpture, that he reminded me of a ‘conductor’ (musical) in the way he set about making his sculpture. I would like to take up this metaphor again because I think it has a great deal of relevance. It is commonplace for sculptors to use assistants, given the nature of the physical demands of the art, (and indeed it is only the advent of the ‘artist as individual’ in post Renaissance Europe that would make the practice of ‘art manufacture’ seem unusual). Even today most large scale sculptural projects require large numbers of assistants, and much smaller scale work is also produced with technical help of one sort or another. Caro’s use of assistants, however, is I believe, much more intimately connected with the character and quality of his work than most. I use the word conductor advisedly, for it seems to me that following his initial ‘wedding’ with the crudities of rough steel construction sections, I beams etc., and not himself being a ’welder’ in the Gonzalez/David Smith artisan sense, Caro very rapidly distanced himself from ‘craft’ and changed from a ‘personal handling’ style of working (a role which he had in fact been used to throughout his earlier modeling years), to a deliberately ‘orchestrating’ approach to constructing his works. From now on, and more forcefully as time and development went on into the seventies and eighties works and later, he took to intellectually projecting his making decisions via the conduits of his assistants or ‘players’ (instrumentalists). This technique enabled him far greater freedom of movement and change in his decision making. It nevertheless also began to produce a sense of a slightly impersonal ‘aura’ to the finished work. His mastery of the ‘score’ became more and more an ‘interpretation’ of an idea, rather than the realisation of an idea; a realisation which would normally be far ‘messier’ and subject to a more direct contact between the thought process and making process of the actual work. 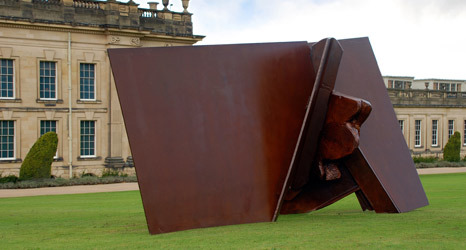 The ‘Table Pieces’ were, I suppose, the last series of steel sculptures Caro made which still retained a feeling of the personal hand-making involvement of the artist, even though they were professionally welded. They still exude an atmosphere of ‘fiddling about’ in the studio with the bits and pieces that are around, and gradually arriving at an idea of what they should be doing which is not preconceived and dictated. The parts, how they connect, what the connected parts do in relation to each other, the directions and movements between them, all still retain a sort of innocence which is not filtered through the instrument of a ‘composer’ directed ‘making machine’(which his assistants represented). It is, in my view, undoubtedly the case that this methodology, that Caro developed and expanded in its sophistication from this period onwards, enabled him to ‘experiment’ in ways that would have been too inhibiting otherwise for practical and technical reasons. It gave rise to the enormous riches of different styles of sculpture making: bronze, fired clay, paper, wood, silver, and others; but always strained through the filter of ‘orchestration ‘. Sculptural originality can of course emanate from this sort of experimentation, but did it emerge from contemplation of the nature and characteristics of the use of these varying materials and the demands of their handling, or was it preordained from his imaginative ‘vocabulary’ and imposed by way of the technical instrumentalists? I ask this advisedly, not as a suggestion that the works achieved thereby are in some way ‘inferior’, but that their effect on the viewer conveys a slight taking away of the sheer enjoyment to be had from sculpture’s ability to involve one in the physical and optical pleasures of an imaginative involvement with ‘matter’ and its manipulation. Perhaps some of the reservations that have been expressed in Abcrit commentaries have something to do with this perception? I have a feeling that Caro himself was aware, to some extent, of the potential effects of the way he worked, but that the ‘Picasso’ syndrome of ever-wider variety and exhaustion of the possibilities being made available was too strong to be gainsaid or abandoned. 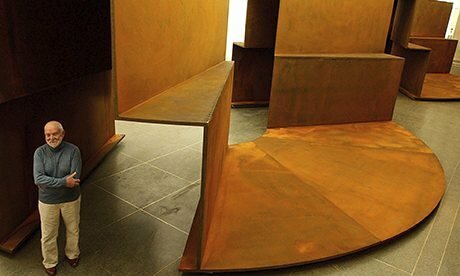 I turn to another aspect of Caro’s work which I think we are obliged to confront; that of ‘subject matter’. Abcrit commentators are not at one as to whether or not there is such a thing in abstract art, and certainly it is, if anything, an even more contentious issue in sculpture than in painting, with which the largest numbers of them are involved. Caro himself turned to ‘narrative’ sculpture making, and certainly would not have wanted to be involved with what he would have seen as ‘narrow definitions’. However, the issue arises, and arises as much with his abstract work. Whether or not an abstract sculptor has a ‘subject(s)’ in mind, the finished object will inevitably give rise to suggestive images in the viewer’s mind. Most agree that Caro’s sixties steel work had a purity, simplicity and originality that placed it on a new plane of what abstract sculpture could mean. Whatever images could have been raised as descriptive of what the sculpture ‘looked’ like, fell by the wayside of inadequacy; these sculptures were ‘themselves’ and nothing else. Even the later sixties more ‘romantic’ pieces, with shaped elements rather than the austere ‘I’ beams, still project themselves as objects without precedence and thereby establishing an ‘abstract’ form of ‘thing’ which was sufficiently unlike anything familiar in sculpture or in the real world. .There were many discussions in the sixties concerning the use of ‘manufacturing processes’ for sculpture and the use of industrial techniques; which invariably ended with the conclusion that it was the end result that mattered and not the procedures. True, but, as I have said, fraught with dangers that can easily turn into a dictatorship of means. 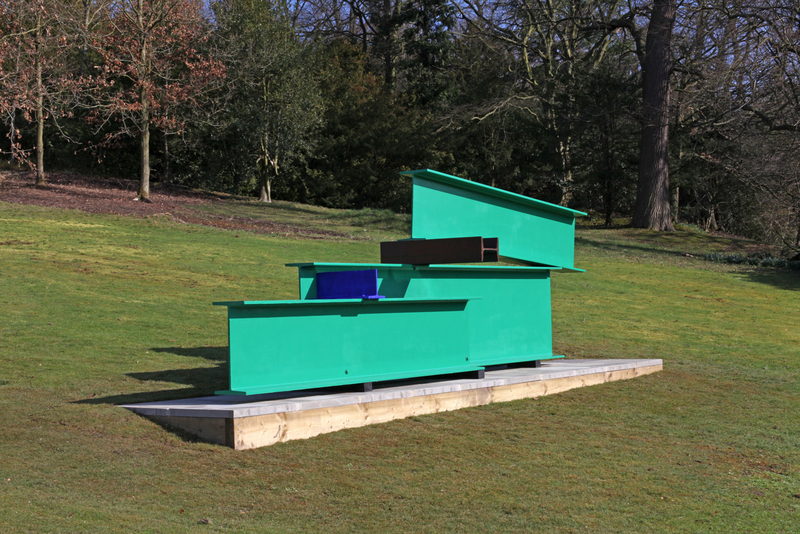 The point about Caro’s own (and others)‘sixties’ sculpture’s construction was that it incorporated a sort of innocence in the way it made use of material and techniques, an innocence which was almost naïve in its lack of sophistication. This ‘innocence’ was dissipated later on by the elaboration of his working methods and the ability it gave to produce on an enormous scale. Had Caro, in his later work, chosen to involve himself more directly with the handling of his materials and perhaps been less ‘in love’ with the wonderful world of scrap steel; thus imposing as a consequence, a discipline which would be much more that of a ‘soloist’ in his ‘music making’, it is possible that the perceived characteristics of the later works would have been less predictable in their formulation. This article is not attempting to make a qualitative assessment of individual sculptures or groups of them, by Caro. Nor is it an attempt to formulate a directive of which works have the most outstanding impact or originality. It is possible that there has been more general influence from his ‘later’ periods of work, than from the pioneering early group; and certainly more widespread variety of criticism and literary analysis. Very few, if any, of these latter, have concentrated much on addressing the issues of sculpture-making raised above, issues which, I believe, are central to any real understanding of Caro’s achievements. This raises the vexed question of the impact and influence of his work on the younger generations of sculptors already in mid career and on those starting out and what effect it has had on the development of new ideas in abstract sculpture? If his output can be categorized as encompassing a range of qualities from opticality (later pictorialism); free spatial movement; disregard of gravity or connection (other than practical); and later on compositional variety; richness of material; surface and texture; and indeed on into reference (narrative); monumental scale; and involvement with architecture; a vast range of qualities to be encompassed by one man’s work, it, presumably would be the case that at least some of these aspects would reappear in more recent sculpture. It is curious, however that very few working abstract sculptors today seem to remain involved with obvious Caroesque characteristics, and he seems to remain rather more someone to react against than to emulate. In fact, the essential characteristics of Caro’s working methods seem, if anything, to have got in the way of being passed down. It is almost as if his construction of a sculpture-building empire and its methods, has come to be seen as unable to deal with the real issues of taking abstract sculpture forward into new territory conceptually. Very few, if any abstract sculptors working today could or would want to be ‘conductors’ in the sense I have outlined. Very few would choose to be in the thrall of the steel ‘vocabulary’, even if working in that material. Very few, it would seem, would wish to be involved with such a vast range of expanding ‘sculpture’ across such enormous swathes of aesthetic territory. Younger abstract sculptors, as has been well documented in Abcrit (and that does not even include those working outside the UK) see themselves, of necessity, as needing to be in absolute personal physical command of the processes they are using, much as a painter would be; believing their individual handling and command of the material is vital to making genuinely ‘plastic and spatial’ decisions necessary to arriving at original advances in what abstract sculpture can achieve and where it should go next and how. Steel is just ‘material’, like any other, and even if it still retains its seductive qualities, these must be firmly kept under control. 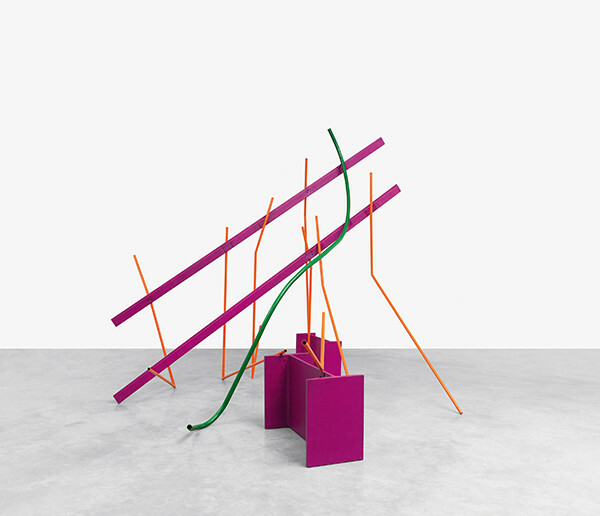 In conclusion, Caro occupies a unique place in the evolution of abstract sculpture. Certainly his coup de foudre of the changeover from figurative expressionist modeling to that of a stumbling innocent adventurer into the new territory of constructed abstraction was a seminal moment, both for abstract sculpture itself and for those younger sculptors who were embarking on finding their own ‘voices’, as well as future generations looking for an inspirational model of what it is to understand professionalism and dedication as a sculptor. Hi Tim, I enjoyed you piece. One of the things about Caro that stands out for me is his musical instinct. He composes – not only from found pieces – but also in the sense of creating structures that reveal themselves, and come to completion, over time. This sense of opening possibilities and allowing them to come in and out of resolution is a standard trope of modern musical development. I once heard an interview on Radio 4 in which he said that he listened to classical music, and said [approximately] ‘I might be listening to a Schubert quartet and hear that he does something, and think to myself- why can’t I try that’. This is particularly true of his [in my opinion better] earlier work. In this the use of negative space is like a note or notes that are sustained and rhythmically articulated- the space between allows them to sing and to interact in complex ways with their neighbouring shapes. Another musical aspect is his openness to beauty and grace as experiences, sometimes to the point of charm and facility- very Italian. His sculptures are intensely lyrical, felt in every detail- even if ‘stuck together’. The later work becomes much more literal in its references and the forms become literally present, and often heavy, rather than created within the complexity of the negative space.To pursue the analogy rather unkindly, the later work becomes either like a melodramatic opera, or a half baked [literally] pantomine. But perhaps once one has done the best so well there are only the murkier regions of aesthetic experience left to explore, if one has to keep moving on? It might well be also that the experience of making by telling others what to do will inevitably alienate oneself from the original sources of inspiration that were found in the direct engagement with the material. Dear Tim,That is a great read and I enjoyed it as though it was part of a series to be continued next week.It had many of the qualities of your own work,thoughtfull nuance and complexity.I am rare in being a total Caro fan,as I was of John Hoyland.What I learned from them is the importance of real generosity of spirit.This was their markers as men,and Sheila shared it too.Judgement was for later,immediately we had work to be done.I was truly amazed at Tonys last sculptures with coloured plexiglass sheets,as the yellow effected everything else you looked at ,including the shadows.I am a Painter and realise the intensity and depth of commitment of the St.Martins sculptors,which I dont attempt to match.Its the tremendous work ethic and extraordinary friendship ,support and brotherhood that marked Tony out as a truly outstanding human being .We fell out ,notably at Triangle in 86 when he attempted to aggrevate us into dealing with post -modernism .I regret that now and miss him and Sheila terribly on the English scene .We that are left have to quit negative carping and rise to the challenge not only to make better,more-original art but effect the way it is seen and help young people to rise to this most difficult of challenges.